Heat 1 tablespoon oil in kadai, add cumin seeds, hing, green chilli, onion and sauté. Add mashed potatoes, salt, chat masala, tomato catch up, mix well. Cook for 1 minute .keep aside. Let it cool. Take one paneer piece, apply potato mixture, put another piece of paneer, make sandwich. Take one bowl, mix corn flour and water, make thin batter. Spread bread crumbs in plate. 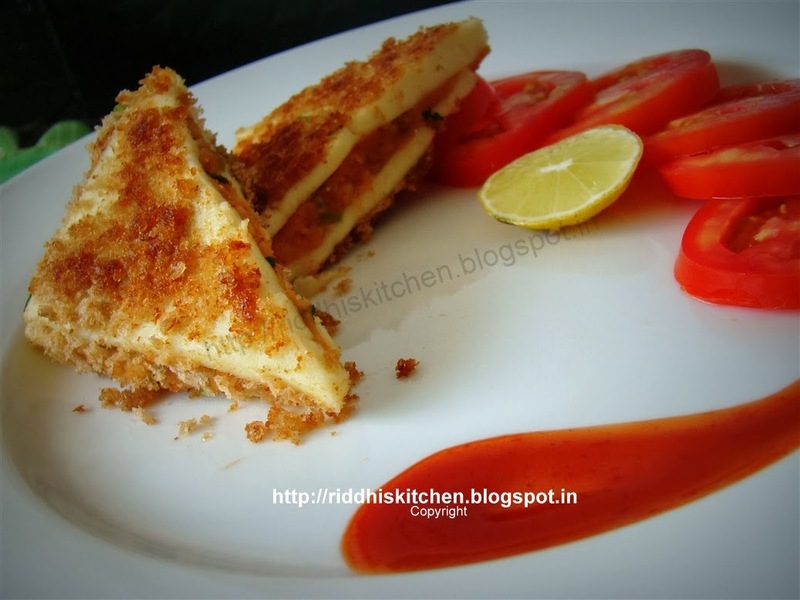 Deep paneer sandwich in corn flour batter, roll it in bread crumbs and shallow fry till bread crumbs become brown .Cut into triangle and serve with tomato chilli sauce.